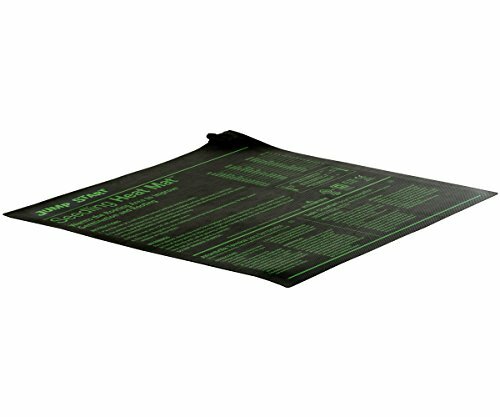 Heating mats are designed to control the temperature level of your indoor and outdoor plants to help regulate growth. The heating mats produce a maximum soil temperature for your plants resulting in the plant growing much more successfully and stopping plants from cutting. This happens because the mats concentrate on where the heat is needed most, which is the soil and the roots of the plants. Having the heat specifically targeted at those areas means that the plants are getting the best treatment and quality, thus giving them optimal conditions to grow in. Some heating mats come with laminated high-grade aluminium foil that helps the heat to spread evenly and distribute to all areas of the soil and roots. 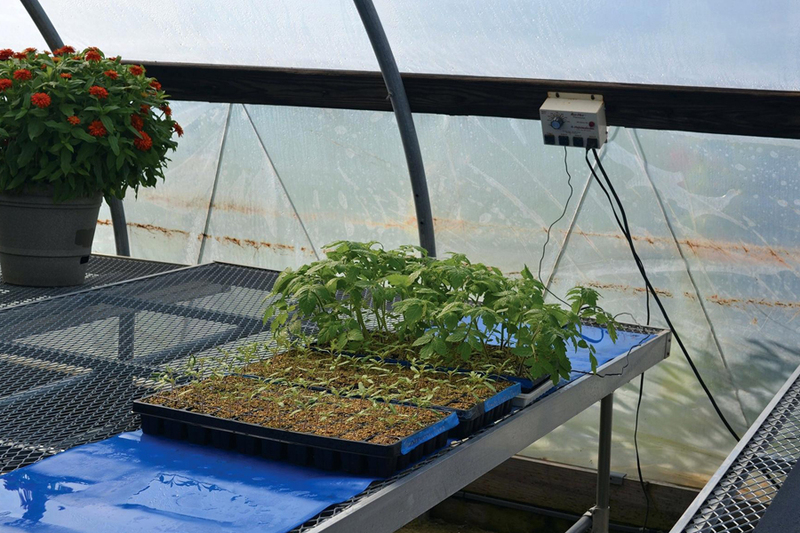 The heating mats can be purchased in many sizes ranging from the smallest to the largest of plant boxes, so you can be sure to find one that will suit your growing needs. The Hydrofarm Seedling Heat Mat works by using the 17-watts it creates to warm the plants root areas to between 10 and 20 degrees over ambient temperature. This improves the seedlings germination and increases the success rate of the seedlings and cuttings to grow. As the product is UL listed, the waterproof construction means that the moisture is trapped inside creating a warm and humid environment for the plants to grow. This Hydrofarm mat has been upgraded with a stronger heating wire that uses thicker, multi-layered materials. The mat includes a 6-foot power cord and comes with instructions on how to use the heat mat. There is also instructional information on the lighting, watering, and planting of your plants while they are used in conjunction with your plants. This mat is ideal for all your vegetables, herbs and flowers that need germination, providing an easy and mess free solution to growing your cuttings and seedlings in their very own miniature greenhouse. The Hydrofarm CK64060 Hot House with Heat Mat is like your very own miniature green house for your plants. It acts in exactly the same way as a greenhouse just on a smaller scale. The 7-inch dome allows you to grow your plants bigger and taller before the need to transfer them to other growing conditions. This also benefits the growth by offering them an increased success rate, as the developing stages are spent in the most ideal conditions. The mat is waterproof, gives out 17 watts/120 volts of power, and measures 11 by 22-inch. 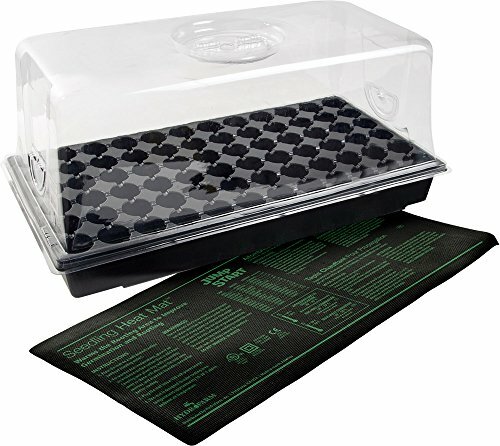 The base tray is also included to start growing your plants right away consisting of 72 cell seedling inserts. The product comes with instructions on the best ways to grow your seeds with many tips and tricks to help you along the way; this in addition to some clonex rooting gel. Having the 7-inch dome allows for extra humidity given to all your plants resulting in a much better growth rate with increased germination. 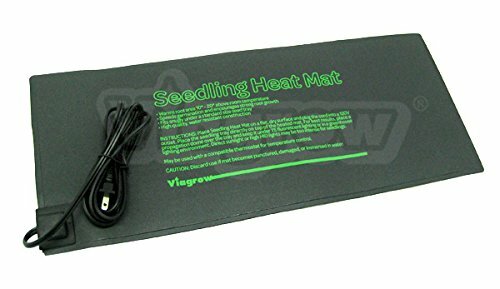 The Viagrow Seed Propagating Seedling Heat Mat is specifically designed to increase seed germination speeds and encourage the growth of strong, healthy roots in young plants. At 20.5 by 8.5-inches, the heat mat can fit snugly beneath most average-sized seed trays, allowing you to optimize the growth operation you have already started. The tray itself is made of a high-quality material that’s water resistant as to not disrupt the mat’s electronic components. As seedlings and clones grow best in 70-80 degree temperatures with humidity between 50 and 60 percent, its recommended to use the mat in conjunction with a thermostat and manual thermometer control as to accurately regulate and monitor the conditions. The mat warms the root zone of your seedlings up to 20-degrees above sitting room temperature. To get the best results, try adding a propagated dome beneath a florescent light to cover the seeds, as this will enhance the effect of the mat from beneath.